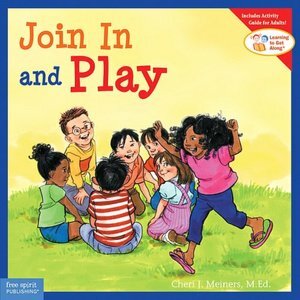 A slightly different book in this post, as it is one of a series specifically designed to aid with the development of children’s social skills. The vast majority of children learn social skills naturally, almost by osmosis. They have an innate sense of how to relate to others and through a natural desire to imitate those around them gradually pick up appropriate sociable behaviour. They seek out company, enjoy play with others and form relationships with their peers very easily. But there are a significant majority of children for whom this process is not so simple, whether through social impairments such as autistic spectrum disorders, delays due to developmental problems or emotional immaturity, or because they have been brought up in households where appropriate social behaviour is neither demonstrated nor encouraged. This book is aimed primarily at the latter groups, but the quality of the approach is such that all children may benefit from their positive approach to social and emotional development. “When I see someone I’d like to play with, I can walk up and smile as I say hello. The person might be looking for a friend too. I can tell something about me, or ask a question. I can listen. I can answer in a nice way. Sometimes my friend invites me to play along. The back of the book consolidates the learning with a series of questions and activities for the adult to do with the child. It is a thorough and well-thought-out approach that would benefit all children, not just those with social difficulties. The series is published by Free Spirit publishing and there are a number of other titles focusing on emotional literacy and the skills of interaction, such as “Listen and Learn”, “Cool Down and Work Through Your Anger”, “Try and Stick With It” and “Talk and Work it Out.” Based on this one they would be well worth a look for children needing this kind of support. An excellent example of didactic publishing at its best. One of the most demanding tasks faced by any parent, particularly the first time, is potty-training. There is so much conflicting advice out there about how to go about it before you even start to deal with the practical issues of introducing a child to the potty, handling potty refusal, encouraging them to go without nagging, calming their anxieties and getting them to sit still long enough to let it out. This book will not potty train your daughter for you, but it will help with some of the above. It’s attractively drawn, girly without being excessively so (ok so it’s pink, but the vast majority of girls will go for that, and the gender division is obviously required by the subject matter) and sensitively and intelligently written. Princess Polly and her baby sister wear nappies; her Mummy, Daddy and big brother do not. “It’s ok for the baby to wear nappies,” says Polly, “but I want to be more grown-up than that.” Princess Polly and her Mummy go out and choose some big girl pants and a potty (there is an opportunity for the potty trainee to pick their own favourite too) and then Polly learns how to use the potty properly. The button on the front is an annoying but useful tool; you press it whenever Polly does something positive, and it works very well to help celebrate those all important early wee and poo successes. The book sets out the rules for using the potty (hand washing, wiping etc) and shows Polly on the path to wearing pants. She finds (like most children) that poo is more difficult that wee to handle, but eventually manages to do one on the potty. She looks justifiably pleased with herself and shows it off proudly to the rest of the family. Our three-year-old thought it looked rather like a brown sausage and was highly amused; something which you need when dealing with a process that many find scary and upsetting. The book is educational, entertaining, ‘interactive’ and a good length to read whilst sitting on the potty waiting for something exciting to happen. A great way to encourage young girls to learn – and there is also a boy’s version too. This is a book from the ‘little learners’ range at Parragon Books. The tabs that stick out are extra pull-out pages that make it enjoyable for little ones to play with and give it that bit of extra interest. Although the choice of emotions and reasons does not follow any obvious pattern and they seem to have been chosen at random (‘bored’ and ‘hungry’, for example, are not the same kind of feelings as ‘scared’ and ‘proud) this is none the less a good book for promoting emotional literacy and opening the door to discussions about different feelings. There aren’t many books that focus on this exclusively and the pull-out tabs ensure this one will hold their interest. Not perfect, but a useful book regardless. It is Splat’s first day at cat school, and he is not feeling particularly happy about it. Despite his excuses his Mum helps him onto his bike and off he goes. At school he meets his teacher, Mrs Wimpydimple, and all the other cats, and begins his lessons. One of the things he learns is that cats chase mice. Which would be fine, were it not for the fact that, in need of a friend, Splat popped his rodent friend Seymour into his lunchbox before he went to school. However, once Mrs Wimpydimple has calmed everything down again it is Splat and Seymour who are able to save the day when the door to the milk cupboard is stuck, and Splat goes home a much happier cat than he arrived. This book is obviously aimed at children starting school who may be apprehensive. In the sense that Splat goes to school unhappy and returns full of excitement about his day, the message is a positive one. However, the difficulties that Splat encounters are too far removed from reality to be of any real use to nervous children. It is inspiring that Mrs Wimpydimple changes her blackboard notes in the light of what Splat and Seymour demonstate but if intended as a support book for young children there is too little of the actual problems they face on their first day, like talking to people, or finding where to eat lunch. 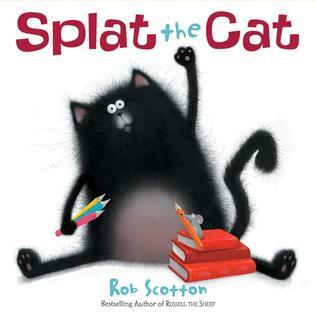 Rob Scotton’s illustrations are distinctive and really appeal to children; they look like they were painted with a spraycan and have a modern, edgy feel. There are some lovely details, like the window of the fish shop as they go by, and Splat’s body language expresses his mood really well. His nervousness is conveyed by the constant problems he creates and excuses he gives as he gets ready for school and the opening of the book works extremely well in that respect. In general however the book reads in a stilted, awkward fashion. The text does not flow adequately well and it is hard to read it aloud, as the pace and mood of the story are not always reflected in the language. At some points it skips too quickly through the narrative, and reading it you do feel that this is a book penned by an artist, rather than a writer. Children will enjoy this for the pictures and for the absurdity of a cat taking his pet mouse to school, but it is a strange book with a slightly muddled story arc and disappointingly awkward writing.